Franchise owners and CFOs need a 360-degree view of individual franchise stores as well as the entire franchise enterprise. Similarly, district and store managers need access to key data in order to monitor performance, identify trends and align resources to meet customer expectations. A centralized financial management solution will support operations at all levels from the store to the corporate level. The leadership team of franchise organizations requires a seamless flow of information, which is difficult when each site, including the central office, is using separate systems. Valuable time is being wasted each time data has to be collected, entered into spreadsheets or specialty software, then emailed and shared between leaders. By the time leaders get the data they need, it’s already outdated and could include errors from the redundant data entry between systems. As a result, managers don’t have reliable information, can’t see the big picture and won’t be able to steer the business in the right direction. Connect your leaders with the data they need to be successful by replacing disparate software with a centralized financial management system. 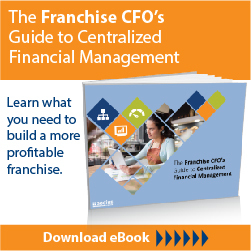 As noted in “The Franchise CFO’s Guide to Centralized Financial Management,” a growing franchise organization needs greater control and visibility into the financial activities of each site. Store managers, district and regional managers, and the corporate CFO must have current, reliable information in order to nurture growth and profitability. Empower employees: Dynamics GP can be used at each franchise location and at the central office. Data is easily entered at each location delivering immediate insight into store and district activities, as well as the organization as a whole. Dashboards, reporting and other business intelligence features offer quick access to key performance indicators (KPIs). Real-time data enables managers to monitor performance, identify trends and act fast on new opportunities. Get perspective: Managers and the CFO will be able to monitor data at multiple levels. From top to bottom, franchise owners can evaluate data, view it from all angles, and make the strategic decisions that promote continued growth. Strengthen performance: Connecting managers with KPIs will strengthen your ability to optimize operations. Leaders following metrics will identify trends such as top performing stores or products, best practices, monthly or seasonal trends, then align resources to capitalize on these trends. Disparate software systems isolate data, making it difficult to access and use. Arm your leaders with the information they need to succeed. Download the eBook and contact us for additional guidance with replacing outdated software systems.